Yugoslav war criminal Slobodan Praljak reportedly died after his 20-year prison sentence was upheld by a UN war crimes tribunal and declaring he had drunk poison. 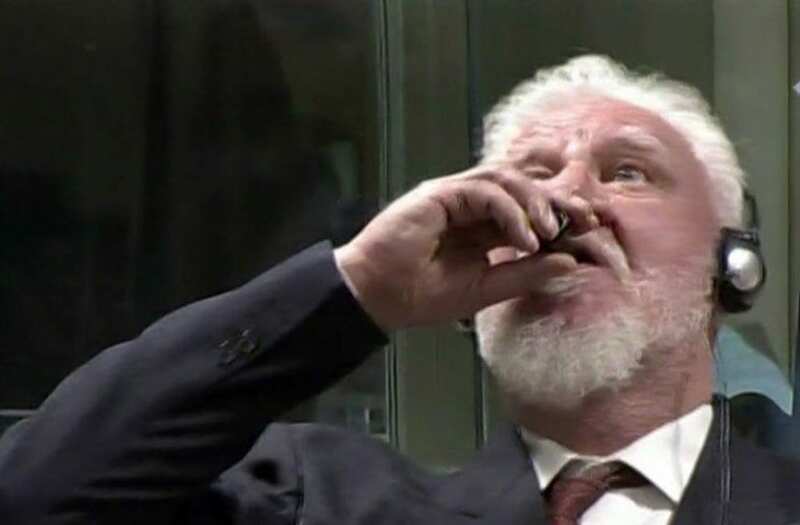 “I am not a war criminal,” Praljak allegedly said moments before drinking from a small bottle of liquid amid gasps during the appeal hearing in The Hague, a city in western Netherlands. Zoran Mladic, a cousin of the former Bosnian Serb military commander Ratko Mladic, walks outside his home in the village where Ratko Mladic was born, Bozanovici, Bosnia and Herzegovina, November 9, 2017. REUTERS/Dado Ruvic SEARCH "MLADIC VILLAGE" FOR THIS STORY. SEARCH "WIDER IMAGE" FOR ALL STORIES. Vasiljka Mladic (L) and Mile Mladic, cousins of the former Bosnian Serb military commander Ratko Mladic, look at old family photographs in front of their home, in the village where Ratko Mladic was born, Bozanovici, Bosnia and Herzegovina, November 9, 2017. REUTERS/Dado Ruvic SEARCH "MLADIC VILLAGE" FOR THIS STORY. SEARCH "WIDER IMAGE" FOR ALL STORIES. Houses stand in the village where the former Bosnian Serb military commander Ratko Mladic was born, Bozanovici, Bosnia and Herzegovina, November 9, 2017. REUTERS/Dado Ruvic SEARCH "MLADIC VILLAGE" FOR THIS STORY. SEARCH "WIDER IMAGE" FOR ALL STORIES. Mile Mladic, a cousin of the former Bosnian Serb military commander Ratko Mladic, poses for a photograph holding old family photos of Ratko Mladic and his family in front of his home, in the village where Ratko Mladic was born, Bozanovici, Bosnia and Herzegovina, November 9, 2017. "I would be happiest if he died before the judgement," said Mile. "We would then raise a large monument for him in the village and write the truth. All this that is happening is not the truth. It is a lie. The general is not guilty." REUTERS/Dado Ruvic SEARCH "MLADIC VILLAGE" FOR THIS STORY. SEARCH "WIDER IMAGE" FOR ALL STORIES. Vasiljka Mladic, a cousin of Ratko Mladic, walks outside her home in the village where the former Bosnian Serb military commander Ratko Mladic was born, Bozanovici, Bosnia and Herzegovina, November 9, 2017. REUTERS/Dado Ruvic SEARCH "MLADIC VILLAGE" FOR THIS STORY. SEARCH "WIDER IMAGE" FOR ALL STORIES. Dusko Mladic, first cousin of Ratko Mladic, poses for a photograph at his house in the village where the former Bosnian Serb military commander Ratko Mladic was born, Bozanovici, Bosnia and Herzegovina, November 8, 2017. A portrait of Ratko Mladic hangs on a wall. "He [Ratko Mladic] did not kill people. During the war he gathered our Muslim neighbours from a nearby village and warned them in time to leave," said Dusko. REUTERS/Dado Ruvic SEARCH "MLADIC VILLAGE" FOR THIS STORY. SEARCH "WIDER IMAGE" FOR ALL STORIES. Ratko Mladic's former childhood house stands in the village where the former Bosnian Serb military commander Ratko Mladic was born, Bozanovici, Bosnia and Herzegovina, November 8, 2017. REUTERS/Dado Ruvic SEARCH "MLADIC VILLAGE" FOR THIS STORY. SEARCH "WIDER IMAGE" FOR ALL STORIES. Trucks are parked in the village where the Bosnian Serb military commander Ratko Mladic was born, Bozanovici, Bosnia and Herzegovina, November 9, 2017. REUTERS/Dado Ruvic SEARCH "MLADIC VILLAGE" FOR THIS STORY. SEARCH "WIDER IMAGE" FOR ALL STORIES. Dusko Mladic (C), first cousin of Ratko Mladic, drinks with his brother and a friend at a makeshift tavern in the village where the former Bosnian Serb military commander Ratko Mladic was born, Bozanovici, Bosnia and Herzegovina, November 8, 2017. "He [Ratko Mladic] did not kill people. During the war he gathered our Muslim neighbours from a nearby village and warned them in time to leave," said Dusko. A portrait of Ratko Mladic hangs on a wall. Writing on the portrait reads: "a hero". REUTERS/Dado Ruvic SEARCH "MLADIC VILLAGE" FOR THIS STORY. SEARCH "WIDER IMAGE" FOR ALL STORIES. A sign reading "General Mladic Street" hangs on a tree in the village where the former Bosnian Serb military commander Ratko Mladic was born, Bozanovici, Bosnia and Herzegovina, November 8, 2017. REUTERS/Dado Ruvic SEARCH "MLADIC VILLAGE" FOR THIS STORY. SEARCH "WIDER IMAGE" FOR ALL STORIES. Praljak had received a 20-year sentence in 2013 for crimes against humanity he reportedly committed in the city of Mostar. Upon hearing the verdict had been upheld, the 72-year-old said: "I have taken poison." Carmel Agius, the presiding appeals judge, reportedly suspended the proceedings immediately after and medics were called to the courtroom. "Okay," Agius said. "We suspend the... We suspend... Please, the curtains. Don't take away the glass that he used when he drank something." Though Croatia's state TV has reported the death, the UN court claims it cannot confirm it. When asked by the Associated Press if he could confirm the incident, a spokesman for the tribunal, Nenad Golcevski, said: "I have no information to share at this point." According to BBC, not even the Dutch police would not comment on the report based on "sources close to Gen. Praljak." Praljak was a commander for Bosnian Croat defense forces. Under his governance, the UN war crimes tribunal reportedly found that he failed to make any serious efforts to stop soldiers from rounding up Muslims in Prozor back in 1993. The war criminal also reportedly failed to act upon information surrounding the planning of murders in addition to attacks on those involved with international organizations and the destruction of Mostar's historic Old Bridge and mosques.